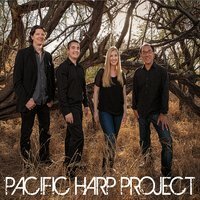 Harp (Megan Bledsoe Ward), vibraphone (Noel Okimoto), bass (Jon Hawes), drums (Alan Ward)—that’s the Pacific Harp Project, a culturally diverse, well-schooled quartet committed, at least on this self-released, Kickstarter-funded debut album, to invigorating traditional harp repertoire with splashes of improvisational jazz and pop (even crossing, on a couple of occasions, into Mancini-like meditations suitable for a noir-ish film escapade or something on the order of Peter Gunn—check out the captivating, moody twists and turns of “Rhapsodie,” built on a classic 1923 solo harp piece by Marcel Grandjany but enticingly expanded texturally [and in subtext] by thoughtful, economical solos courtesy Okimoto on vibes and Hawes on bass). A template is established in the captivating opening number, “Sonatine.” Composed by Marcel Tournier in 1924, Sonatine pour harpe, Op. 30 was itself inspired by Ravel’s Sonatine for piano. The arrangement by Megan Bledsoe Ward opens up into a brisk, jazzy shuffle keyed by her fleet harp soloing and a tenderly stated theme-and-development by Okimoto’s vibes. Fortunately for listeners, Ms. Ward’s liner notes serve as an informed guide to what is taking place within each track in terms of style, structure and reimagined approaches. The dozen compositions here are evenly divided between originals by Ms. Ward and Mr. Ward and otherwise by Ms. Ward’s inspired arrangements of works by Ravel, Debussy, Liszt, in addition to the aforementioned tunes by Tournier and Grandjany. You always anticipate beauty from Ravel and Debussy, and so beauty ensues everywhere the PHP takes these composers’ works. For instance, in Danse Sacrée, the first of a two-movement Debussy composition, the harpist’s intoxicating, swirling glissandos and evocative arpeggios remain but Ms. Ward rewrote the bass accompaniment. So now we hear Mr. Hawes discreetly following the harp with a sotto voce monologue of steady, supportive contrasts to the harp’s harmonic shifts; in the second movement, Danse Profane, the main theme has been transformed into a jazz waltz, springy and ebullient, with the vibes and drums enhancing the uplifting mood with energetic retorts tastefully deployed. Ravel’s Intro & Allegro (composed in 1905) is presented as a kind of companion piece to Debussy’s Danses, with, again, the harp part hewing close to Ravel’s intentions whereas the other instruments take matters into a different dimension. 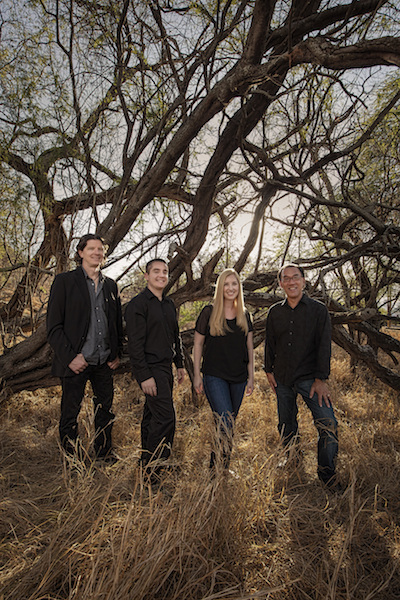 For a bit the harp falls away as the vibes, bass and drums swing into a cool, understated groove with Modern Jazz Quartet overtones. The harp returns, rather sneakily, about midway through the six-minute track with a series of arpeggiated musings of a more contemplative nature than what the other instruments were laying down; then, near the four-minute mark, a dramatic arpeggio signals a dark turn to the proceedings, a curious, enveloping sadness both sweet and mystifying that seems to be heading towards a dirge-like finish until…at about the five-minute mark the clouds lift and the bright, sunny melody returns, along with the emotional lift the vibes provide, and everyone lives happily ever after, so to speak. A live performance of Marcel Tournier’s Sonatine pour harpe, Op. 30 (1924) by Pacific Harp Project at Medici’s in Honolulu, HI, November 22, 2014. The studio version is the first track on PHP’s debut album. The original tunes follow this template as well. One of the album’s most memorable moments is Ms. Ward’s “Willow Waltz.” An engaging simplicity marks this work, from the unembroidered harp part establishing a lovely melody line and returning to it following a lively vibraphone discourse as the drums provide an unobtrusive underpinning. Her “Serafina,” with its exotic sounding arpeggios and wash of percussion underneath, along with some atmospheric clicking Mr. Ward contributes on bass, is a delicate, tranquil gem with a bit of an Asian feel about it. With a melody “inspired by spy movies,” as Ms. Ward writes, “Incognito” closes things out rather unexpectedly in being so haunting and ominous. There’s a lot of space in the arrangement, many dark corners where the bass is found whispering conspiratorially and the vibes hint at something untoward in the offing, as the harp offers only scattered notes here and there, like a nervous onlooker to subterfuge, until the whole exercise fades to silence. In the end, the individual virtuosity of the PHP players is most admirable; that the album sings, if you will, owes everything to the passion and commitment the musicians bring to the music. And in Megan Bledsoe Ward the harp has found an advocate to whom attention must be paid. Presumably the group takes the Pacific part of its name from the musicians’ home base of Hawaii but the dictionary definition of “pacific” gives us meanings such as “calm; tranquil” and “at peace; peaceful” and “peaceable; mild.” Here’s where the delicate balance is struck most impressively: calm, tranquil, peaceful, mild, PHP’s is soothing music in a troubled time but not so soothing as to be unchallenging. It’s all good.